We’d love your help. Let us know what’s wrong with this preview of The Divine Commodity by Skye Jethani. To ask other readers questions about The Divine Commodity, please sign up. I like this concept. I am a Christian and although I do not attend church services at a church, I watch services weekly on TV. The parts I hate the most are when the services wrap up and ask for "donations" for their study guides or CDs. Jesus isn't for sale. Will this book help me with my faith? ***** Finished, enjoyed, would recommend and will likely read again myself within the next 2 years. An easy read book that will make you think about how our current pop culture and economic system have impacted our relationships and worship. Although you have an occasional hyperbole (Nike making profits from the death of a young man), Jethani's insights and logic paint a convincing argument for working to make the Church counter-cultural rather than going along with the culture. Excellent book...written to be easily understood by a non-theologian like myself...engaging writing that kept me reading...thought-provoking, critical look at today's church without being judgmental...solid foundation in Christ...I've recommended it to all of our church leaders. I knew this book would be good, Skye is an excellent analyst and writer. but I did not expect this to be beatiful. This is the best and most constructive response to christianity and consumerism that I have read. When I started reading this book, I was convinced that I'd love every word, however, by the time it was finished, I found myself largely unsatisfied with the author's conclusions. On the positive, the book itself is a very enjoyable read. Jethani does a beautiful job blending together stories alongside the art and life of Vincent van Gogh. He also does an excellent job identifying the problem of our consumer culture and the damage that it's done to individual Christians as well as popular Christi When I started reading this book, I was convinced that I'd love every word, however, by the time it was finished, I found myself largely unsatisfied with the author's conclusions. On the positive, the book itself is a very enjoyable read. Jethani does a beautiful job blending together stories alongside the art and life of Vincent van Gogh. He also does an excellent job identifying the problem of our consumer culture and the damage that it's done to individual Christians as well as popular Christianity. I found this book in the bibliography of "The Prodigal Church" by Jared C. Wilson. Now having read it, I firmly believe that Wilson's book shamelessly raided "The Divine Commodity" for its best points and reasoning and repackaged it for its own use. Written by Skye Jethani, "The Divine Commodity" is an eloquent, literate, readable manifesto in which the author writes against trend of churching being treated as a business venture rather than as a religious fellowship. Jethani presents evidence that I found this book in the bibliography of "The Prodigal Church" by Jared C. Wilson. Now having read it, I firmly believe that Wilson's book shamelessly raided "The Divine Commodity" for its best points and reasoning and repackaged it for its own use. Jethani presents evidence that megachurch pastors such as Bill Hybels have popularized the idea that a church can rightly judge its success by the number of people warming pews. The problem with this approach, says Jethani, is that the church was never meant to be an end in itself, but rather as the means by which people communicated with God in the company of fellow believers. The result of the former attitude being adopted widely in the American evangelical church is disastrous. Most modern churches now focus on how to give church attendees an "experience" which conforms to their individual religious tastes and preferences. Adherence to a specific doctrinal code to be reflected in preaching style and sacraments is made secondary to just putting on a good show. Jethani eloquently discusses in each chapter of his book a portion of the life of Vincent van Gogh, who was himself a devout and charitable Christian who at one point attempted to become a minister. Van Gogh's unorthodox methods, however, caused friction between him and the institutional church, which he grew to intensely dislike. Van Gogh's dedication to the poor and impoverished is contrasted by the author to the modern megachurch model of attracting wealthy and influential persons to the church. He goes so far as to compare this to the sorry state of the church in Corinth as detailed by the Apostle Paul in 1 Corinthians. If "The Divine Commodity" is the intellectual backbone and spiritual predecessor of "The Prodigal Church," then I couldn't recommend anything better on this subject. "The Prodigal Church" lacks the intellectual vigor of "The Divine Commodity," but it does have a sole advantage of having a slightly more contemporary understanding of the matter. I thought this book had some fresh insights. There were a few areas where I thought he was a little critical. He talked about theater and other artistic licenses that are used in church which he saw as commercialism. However, he uses Van Gogh's art to paint beautiful imagery. It seemed like a contradiction to be able to use one medium of art and frown upon another in attempting to connect with God authentically. He also cast living in the suburbs as a product of being a consumer and that it caus I thought this book had some fresh insights. There were a few areas where I thought he was a little critical. He talked about theater and other artistic licenses that are used in church which he saw as commercialism. However, he uses Van Gogh's art to paint beautiful imagery. It seemed like a contradiction to be able to use one medium of art and frown upon another in attempting to connect with God authentically. He also cast living in the suburbs as a product of being a consumer and that it caused a break down in community due to isolation. I have always lived in the suburbs and our neighbors have been wonderful friends, so this personally felt like this point of his was subjective and not completely fleshed out. Jethani offers a compelling look at how the modern Western church has adopted a consumerist approach to Christianity. Using Vincent Van Gogh’s life as a vehicle, he examines today’s 501c3 church, it’s priorities and values, and it’s audience’s expectations in light of historic and biblical realities. Ultimately, he challenges readers to re-evaluate their assumptions of how the body of Christ should approach ministry. Engaging, well-written, and worth the read. Jethani has an excellent WORD for today's church. We are so consumer driven and he exposes it, even claiming that he, himself, is consumer oriented. His ability in expressing his deep thoughts on the matter is engaging and probing. In the epilogue he calls he church to disciplines like silence, prayer, fasting, love, hospitality, and friendship. This is a great wake-up call for those who seek to be followers of Jesus. I love this book, on many levels. A wonderfully written book exposing how our current consumer culture has affected our relationships with each other, God, and our collective paradigm of Christianity. With a bonus parallel story woven in of Vincent Van Goghs spiritual journey and divine inspiration behind his works. Which certainly resonates with me, and I'm sure will with a lot of others. Great book! Skye did an outstanding job in this book. He takes Scripture, weaves it with a story about the painter Van Gogh, and delineates for us how the Church is really missing the boat in today's society. He "paints his picture" and then brings his book to a very simple, eloquent conclusion. This is a must-read for Christians. Easy to read, insightful look at the invasion of consumerism & marketing strategies into the modern American church. Skye Jethani is quickly becoming one of my favorite writers on modern Christianity. This was one of the first books I downloaded on Kindle when they first came out. This is a great book, I should not have waited so long to read it again. In 'The Divine Commodity,' Skye Jethani analyzes the way that consumerism has creeped (and sometimes shoved) its way into the church. Rather than standing as a kingdom witness against the age, the church all too often has simply reflected the culture, accomodating Christian faith with commercialism and consumerism. This syncretism, while making the church more palatable to some in our day, has cost the church its distinctiveness, and indeed some of the very qualities that make the church a visible sign of a new kingdom, a new order, a new way of life. In many cases, the church's adoption of market principles has cost it its very identity. There are several books about the effects of consumerism on the church. What makes Jethani's book different, however, is its tone and approach. The temper of the book is not that of a jeremiad. Jethani avoids the pitfalls of the angry denunciator to which so many succomb. Most cultural critics, while often successful at rallying the troops, do little but annoy those not already convinced of their propositions. In contrast, 'The Divine Commodity,' while forceful and persuasive, is not abrasive, and therefore will gain a wider audience and perhaps will actually change the perspectives of some. Jethani's book also is of a different quality in that his prescriptions for combating consumerism in the church are not aimed at top-down organizational changes. So many cultural critiques leave the reader with nothing to do but bicker and complain at the institutional church and the wickedness of those in authority. 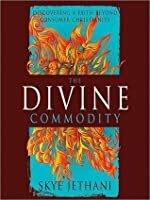 'The Divine Commodity' focuses rather on personal disciplines -- silence, prayer, fasting, love, hospitality, and friendship -- as a means of loosening consumerism's grip on the individual reader. Only the most obtuse of readers could finish Jethani's book not thinking about their own complicity in the church's debacle. And Jethani offers plenty of encouragement of how to reverse this trend in your own life. There is a lot that could be said about Jethani's specific analysis of consumerism's hold on the church (bigger is better, staging experiences, marketing the gospel, programs as the be-all-end-all of ministry, felt needs over missional service, customization versus community, etc), but I'll leave that for you to read yourself. Perhaps the thing that makes this book most enjoyable is Jethani's use of anecdotes, both personal and historical. Jethani tells you much of his own life, his struggles and victories, throughout the book. The only character who appears more often is that of Vincent Van Gogh. Jethani masterfully uses the life of the artist to tie together themes throughout. Not only is this effective in illustrating points, the use of Van Gogh's story makes 'The Divine Commodity' a very interesting read. Interestingly, I've read a few other books that focus on how our society is becoming more and more based in pleasure, not in duty, not in discipline or anything else (Jethani speaks greatly of reclaiming certain disciplines). One was Neil Postman's classic, Amusing Ourselves to Death, in which Postman asserts that our society was essentially turning into pure entertainment - mainly public discourse, education, and religion. Religion, of course, is expanding on significantly here. (Oddly, it was in Jethani's book With in which I first heard of Postman's book.) The other was Whitebread Protestants, by Daniel Sack, who discussed the development of the modern church in terms of "church socials." Ultimately, though, Jethani says that the American church has turned into a product to be consumed, the destination itself and not a means of transportation to the destination. The Church has transformed into an enterprise instead of a community, of broken individuals, moving together to find God, to understand God, to seek communion with God. Pastors use books recommended by economists for growing businesses. Instead, Jethani encourages us to plant and water seeds, but not try to control the greatness of our impact, for we are not able to make the seed grow. Only God can do that. He encourages us to reclaim our imaginations, our abilities to vision God in prayer and in wonder, and to re-instill that wonder. He encourages us to reclaim the silence, to find that wonder. He encourages us to find our identities in God, not in brands, to take up personal relationships and community (something increasingly rejected during the age of Social Media), to find the unity the church has long since promoted - not to be divided by class or race or anything else like that. It boils down to finding the original God for who he is, fighting the Consumer Culture. He speaks of this in With considerably. God does not exist for my pleasure. I exist for his, I exist to live in community with him. Our goal here is to serve him, to live with him, and to plant seeds, not matter how small. It is not our vision to be fulfilled, but His. Before you even read the book you have to say it’s pretty encouraging that it even exists. Not long ago a book on consumerism from a mainstream American publisher was a rare thing indeed, there still aren’t many in existence and this one deserves to be near the top of the pile. In nine chapters Jethani unpacks how consumerism has leaked into the church. American is at the forefront of a consumer society, its leading edges are all in America and American Christianity is at the forefront of consume Before you even read the book you have to say it’s pretty encouraging that it even exists. Not long ago a book on consumerism from a mainstream American publisher was a rare thing indeed, there still aren’t many in existence and this one deserves to be near the top of the pile. In nine chapters Jethani unpacks how consumerism has leaked into the church. American is at the forefront of a consumer society, its leading edges are all in America and American Christianity is at the forefront of consumer shaped religion. There are lessons to be learnt simply from the descriptions of the church that the author provides. American Christianity continues to fascinate me, it is part car crash and part inspiration. Some of my best teachers are Christians birthed, taught, shaped and formed in the cradle of American Christendom. At the same time there is a side to the church there that I simply cannot grasp or comprehend, I have no idea how this monstrosity came to be and how it relates to the Christ I follow. Fortunately that’s not my problem to solve and our God is a gracious God. In response to this monstrous creation birthed by the illegitimate union of the church and the shopping mall, Jethani uses the life and work of Vincent Van Gogh to help us rediscover the spiritual disciplines of silence, prayer, love, friendship, fasting and hospitality that have both stood the test of time and served the church well as gifts from God. The use of Van Gogh is interesting and certainly served as a useful reminder of both the genius and the spiritual zeal of the Dutch artist, although I’m not sure how successful it always was as a bridge between the poison and the antidote. Jethani understands the power of consumerism well and sees how pervasive its influence is on the American church, his insights hit the mark time and time again and his journalist background shows through. After such a clear diagnosis I wanted a sharper response, I wanted the battle lines drawn more clearly, the solution more boldly proclaimed but, perhaps he’s right, that to do so would have fallen into the trap of offering another option, another choice to be consumed if you feel like it or not if you don’t. 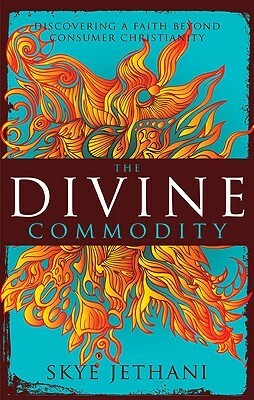 I just finished Skye Jethani's book The Divine Commodity and found it to be both fresh and convicting in diagnosing much of the state of contemporary Christianity. One of the main characters in his book is the Dutch artist Vincent van Gogh. Jethani does an excellent job telling the story of the modern church through the works and life van Gogh. Here are a few excerpts from the book that really struck me. "Ministries that focus on I just finished Skye Jethani's book The Divine Commodity and found it to be both fresh and convicting in diagnosing much of the state of contemporary Christianity. One of the main characters in his book is the Dutch artist Vincent van Gogh. Jethani does an excellent job telling the story of the modern church through the works and life van Gogh. Here are a few excerpts from the book that really struck me. Starting off at a worship service filled with lights and sounds not uncommon to concert venues, Skye sensed his growing frustration with the church being all about entertainment so he began searching for a life that needed rejuvenation. So using some of the descriptions of the life and art of Vincent Van Gogh, he immediately captures the reader's imagination and captivates their spirit. He directs us to the disciplines that we so often forsake - fasting, prayer, worship, silence, etc - and leads us on a journey to the heart of what God desires for us. Skye Jethani writes with a poetic quality untapped in many pulpits. And his imagination astounds me. It is no wonder that he is one of the leading voices in the church today as the managing editor of Leadership Journal. If you are searching for something past the mundane of your life, read this book. If you need rejuvenation in your soul because your imagination has wandered off, read this book. This book will hit you in the teeth and leaving you gasping for air. I cannot recommend this book more highly than I am now. This book has kept me thinking for weeks, and I have shared its basic tenets with friends, sparking some lively discussions. It is the first book I have read dealing with the issue of the "consumer" mentality of post-modern America and how it has infiltrated our churches. Do you remember the old Burger King T.V. commercial that jingled about having your hamburger "your way?" Many churches cater to the mentality that we are consumers, and "church" is something to be sold. They lure its members b This book has kept me thinking for weeks, and I have shared its basic tenets with friends, sparking some lively discussions. I agree that the church looks just a little too much like the world; I do feel uncomfortable every time God is sold, packaged, & presented with instructions, etc. This books strength is in its warnings against a Christianity that compromises with its surrounding culture. But its weaknesses are that its summaries of Christianity & the state of the world were maddeningly superficial, & that its prescriptions are often so flimsy that I don't know what to do with them. So the book is okay, for those who want to read a rant against the church & nothing more than you will think this is great. But if you want more, thought provoking, genuinely truth oriented, questions & answers then go read Os Guinness, David Wells and others like them. This book is really less about Faith and more about the history of Vincent VanGoh. The first two or three chapters does connect with the theme of faith beyond consumer christianity, after that it just became repetitive and boring. It was a very interesting read and did force me to stop and think several times about the message intended. I had to put this book down several times and walk away just to absorb the message. I learned a lot about Vincent VanGoh and his life, and can even see the conne This book is really less about Faith and more about the history of Vincent VanGoh. The first two or three chapters does connect with the theme of faith beyond consumer christianity, after that it just became repetitive and boring. It was a very interesting read and did force me to stop and think several times about the message intended. I had to put this book down several times and walk away just to absorb the message. I learned a lot about Vincent VanGoh and his life, and can even see the connection the author was trying to make between Vincent's life and Christianity, but I felt like the book took a lot of side roads and was very dull. An interesting, enjoyable blend of biography (of Vincent van Gogh) and critique (of contemporary church strategies). Jethani's observation of consumerism's grip on the church is accurate (bigger = better, branding the church, felt needs over missional service, customization versus community, etc), but his proposed remedies (silence, prayer, fasting, love, hospitality, and friendship) - though good and needed in their own right - don't seem to match the magnitude of the problem. If you've read any An interesting, enjoyable blend of biography (of Vincent van Gogh) and critique (of contemporary church strategies). Jethani's observation of consumerism's grip on the church is accurate (bigger = better, branding the church, felt needs over missional service, customization versus community, etc), but his proposed remedies (silence, prayer, fasting, love, hospitality, and friendship) - though good and needed in their own right - don't seem to match the magnitude of the problem. If you've read any critiques of the contemporary - and there are plenty - then you probably don't need to read this one - much of the same stuff here. But if you haven't, then I recommend starting here to stimulate some thoughts of your own! Jethani approaches the topic of consumerism in the church from an insider. His judgment is tempered by his own realization of he own shortcomings and his own consumerist desires. This is refreshing and challenging. Refreshing, because Jethani doesn't presume to have this all figured out and perfect; challenging because I am compelled to look beyond the speck of consumerism in the eye of the church and look at the log of consumerism in my own eye. Jethani identifies the issues of consumerism in th Jethani approaches the topic of consumerism in the church from an insider. His judgment is tempered by his own realization of he own shortcomings and his own consumerist desires. This is refreshing and challenging. Refreshing, because Jethani doesn't presume to have this all figured out and perfect; challenging because I am compelled to look beyond the speck of consumerism in the eye of the church and look at the log of consumerism in my own eye. Jethani identifies the issues of consumerism in the church and provides ways to pull back and recognize Christ for who He is, not just for what He can provide for us. While at points his book felt a bit rigid, Jethani's humble appraisal of his own struggle against being a part of the problem while still seeking a solution, and the very interesting and parallel struggle of van Gogh, gained my full attention. What solves the problem of the "commodified" church culture? Jethani provides multiple examples of individuals, including Christ, whose lives are "counter-commodity" and whose examples serve to remind me that ministry is life-on-life, one person at a time. While at points his book felt a bit rigid, Jethani's humble appraisal of his own struggle against being a part of the problem while still seeking a solution, and the very interesting and parallel struggle of van Gogh, gained my full attention. What solves the problem of the "commodified" church culture? Jethani provides multiple examples of individuals, including Christ, whose lives are "counter-commodity" and whose examples serve to remind me that ministry is life-on-life, one person at a time. When churches are effective, they live this out. Worth the reflection that comes from the read.